Its 9.30 am on a sunny Saturday, the usual drill is to meet Goans engineering a social change in the state of Goa and who have had some impact in bringing a change in Goa or upholding Goa’s culture, usually meeting people with a good background of academics. But this time around we meet six different women who are housewives, traditionally fisherwomen, backward from the Scheduled tribe’s community, women who had no income or livelihood but who have decided to join a Rural Development Authority sponsored Self-Help Group (SHG) in their village and learn something new and make a difference. Shushila Gaonkar from Kirlapal Dharbandora mans a stall from her Self Help Group at the exhibition and is trying to sell her Palm Thatched and woven hats just ahead of Carnival. Her skill to make coconut shell and coconut leaf handicrafts is a skill she picked up from a training imparted by Agriculture Technology Management Agency (ATMA) in her village. “Previously I was a housewife and had no source of income or exposure and was stuck in my village more known for mining and the entire village is usually dust infested and later when the mining ban came our husbands were jobless. 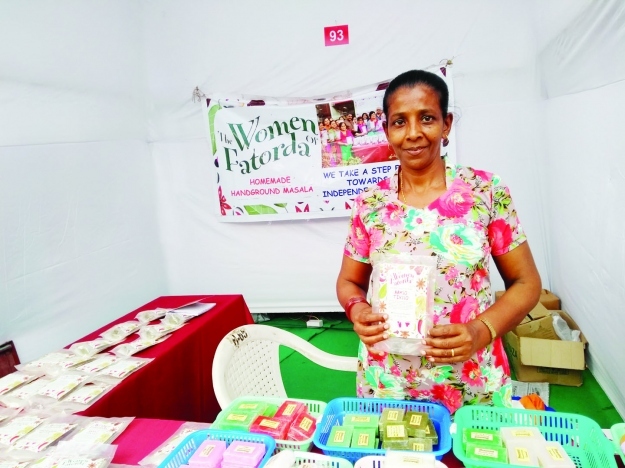 It’s when I took this training in coconut-related handicrafts and am learning to not just make things but even market and sell them,” stated Shushila Gaonkar from Kirlapal, Dharbandora, a village situated around 20 kms of the interior of Ponda. Pratibha Yevdi from Pratapnagar Dharbandora, who is in her late 50’s has a few items for display and is busy making a crochet table cloth. Pratibha remembers how the RDA had a small programme in her village which she attended nine years ago. “Ten years ago if I had grown some extra vegetables, I didn’t even have Rs 10 to take a bus to Ponda and sell those vegetables. I learnt crochet as a skill and today I go to markets and exhibitions and not just sell my produce but also sell tablecloths and baby dresses,” explains Pratibha. Milan Pagi from Betaal Canacona is from the Pagi community where the women help their husbands collect fish from the nets drawn from the sea at Canacona and their only occupation is drying fish and struggling to sell it. “It’s then that I thought if Pagi women could meet people at the market to sell dry fish then why can’t I not sell other things to people. After all the dry fish is not messy and does invite people towards us at markets,” stated Milan. Milagrina Fernandes from Fatorda, Margao belongs to the pocket of Scheduled Tribes in a constituency that’s predominantly cosmopolitan and known for its increasing buildings in Salcete. Milagrina, ST woman known for their agriculture, known for working as domestic help in homes, being a part of the selling fish or sausages business, wanted to do something different. She joined the Usha Sardessai run women of Fatorda Self-Help group. Manisha Nagurkar from Curchorem has used her zeal, patients and creativity to not procrastinate in her free time as a housewife but to use her skill of embroidery to earn an income for her and become independent women. “It takes me eight to ten days to make one set of tablecloth or bed sheets with embroidery on them while I then take it to Raia, Chandor and many other markets by bus and sell it to people,” explains Manisha. Smitha Verenkar from Suryavanshi Bicholim is busy squatted on the floor and using her glue gun to carefully stick together small shells and making handicrafts of shell work which she sells and takes orders for table pieces at weddings and functions or even for bulk corporate gifting. “I was a housewife and years back I came across a Handicrafts department training programme and learnt with few other women how to use shells we found on beaches to make handicrafts and that was the start to many new ventures,” stated Smitha.